Ingredients: Rice vinegar, Habanero pepper, Pineapple, onion, Garlic, Natural liquid smoke flavor, Brown sugar, Cornstarch, Cayenne pepper, sodium benzoate and potassium sorbate to extend freshness. Smell: smells like a Cajun sauce, but with a twist. I can definitely smell the natural liquid smoke flavoring, and the pineapple. That give it that twist. 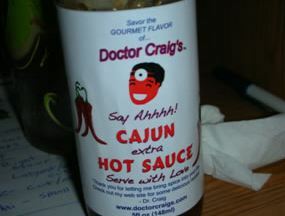 Taste: the main flavors in this sauce are the smoke flavoring and the pineapple, with the Cajun as a background flavor. By Cajun I mean the little bit of vinegar and the cayenne peppers that make the traditional Cajun sauce. 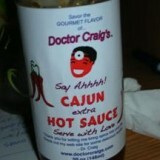 This sauce also has habanero’s and they give it an extra kick. It is defiantly not your average Cajun sauce; in fact the differences are almost enough to not even consider it a Cajun sauce at all. It is really good though. Even though it is really sweet and I don’t like sweet I loved this sauce. Meal: the first thing I tried this on was an egg and it was a great match, I fried it so that there was just a few drops of runny yolk left and then let the sauce mix with the yolk while I was eating it. the first thing I noticed was the smoked flavor and then the little bit of sweetness, with a little bit of heat that didn’t really build enough to notice until I was taking the last few bites. Because of the liquid smoke flavor to it I decided to try it on a burger. Liquid smoke is something I haven’t used in a while but my father used to put it on burgers and jerky so that’s why I thought the sauce would be a good match on a burger plus I had been day dreaming about a burger with chopped scotch bonnets and bacon in it for a while. The first picture there shows 10 good sized, fresh from my garden scotch bonnet peppers, bacon in the middle, and a pound of hamburger. The second picture shows everything mixed together and made into 2 burgers, the larger of the two is the one I am using this sauce on, the other ended up being a hell no burger. After mixing everything together I cooked the burgers on the grill. I had my hart set on a onion bun that I purchased a package of the night before, but when I went to get it out I noticed they where moldy, and not just a little bit either I don’t know how I missed it when I bought them but I wasn’t going to have one. Instead I took two pieces of bread, and buttered and garlic salted one side of each the way I would make garlic bread. I cooked the one side the same way I do garlic bread also which is just on a pan until it starts to brown. Putting the garlic sides in the middle so my hands where touching the regular side I constructed my burger with a piece of cheese and some doctor craigs Cajun xtra hot sauce. I almost forgot the picture but remembered after a couple bites. This picture is just to show how thick this burger is, it really was a large burger. The bacon and scotch bonnets gave it a really good flavor and added a good amount of heat to it on top of the sauce, I ate the rest of the bottle of sauce before writing this though so that I can accurately describe the flavor and heat level of it. Heat: 2.9/10 its not really hot, but its hotter than most Cajun sauces you just have to let it build a little. Smell: 8/10 there is nothing that really stood out more in the smell or taste of this sauce. Price: The website is still under a lot of construction, but they do have it set up to buy some sauce, the price is decent and includes shipping in it, but the only thing is you have to buy 2 bottles in order to place an order. I see why they do that, the price of shipping is included and it’s cheaper per bottle to ship two. I always buy a couple bottles to make the most of shipping myself, but overall I think it might hurt there sales. If it’s a sauce you have never tried why buy 2 bottles? They do have another type of sauce also so you can get one of each but id recommend getting 2 of these if though. if anyone tries this recipe either cook your bacon a little first or make your burger thiner because the only problem i had was that the bacon was on barely done and i had a few pieces in it that i had to pick out. its been a while since i wrote this review and reading it is taking me back, its about time for another bottle. You are one interesting guy Justin. Scotch bonnett burger. I would call it a SB burger but some of our slow readers might think they are getting free lunch on their ride to school/work/institution. I will have to look at the website over the weekend. Nice review. Great review Justin. The shipping kills all chances of selling 1 bottle per order in my opinion so you’ve made a great observation here and I really don’t think it hurts the online sales. I cooked some burgers like this with a liquid smoke hot sauce concoction that I am toying with the other weekend and they came out pretty darn good. Which reminds me, I need to get my Bumpkins for Dummies updated so I can understand you assclowns. >>The shipping kills all chances of selling 1 bottle per order in my opinion so youâ€™ve made a great observation here and I really donâ€™t think it hurts the online sales. Mostly, that appears to be true – though for Fat Tire Fire I’ve got shipping down to $3.50 for a single, so it can be done. Nice review too – sounds like pretty good sauce, and that burger looks awesome. DK, you are right again. I really don’t need to get it right though when I have a virtual editor lurking in the shadows at all times. Thanks bro. I’ll lend you mine. As DK pointed out, I never refer to my copy anymore and just kind of wing it. That’s pretty durn awesome! How are you accomplishing that if you don’t me asking. My shipping API pull quotes directly from UPS, FedEx & USPS but the cheapest rate I’m getting is around $7. I’d like to know how you can ship that cheap also. Killer graphics on your Blue’s Habanero Reserve label Steve. Who put beer in Leroy’s bowl? I wrap a bottle in a zip-loc (just in case it would break but none have) and it fits in the box tight, with no further packing material. For two bottles, it’s less expensive to mail two separately, but I don’t – I pay $7.00 for priority. For larger quantities, like a full case, UPS is the way to go. Great advice for anyone bottling in the 5oz. size. Now what to do about larger bottles? i like beer. i like beer. i like beer. i like beer. i like beer. i like beer. i like beer. i like beer. i like beer. Thanks for the reply…as you can see, it was on the minds of a lot of manufacturers. Sorry, one other question. Is the $3 USPS charge a flat rate for all contiguous states in the US? >>Sorry, one other question. Is the $3 USPS charge a flat rate for all contiguous states in the US? You bet. As long as you’re under the 13oz 1st class weight limit, it’ll go anywhere.